Hidden since the Jubilee of 2000, the Holy Door in St. Peter's Basilica was revealed Tuesday as the brick wall covering it was removed in anticipation of the Holy Year of Mercy launching next month. The rite of the opening of the Holy Door is intended to symbolically illustrate the idea that the Church's faithful are offered an "extraordinary path" toward salvation during the time of jubilee. Vatican City (CNA/EWTN News) - Cardinal Angelo Comastri, the Archpriest of St. Peter's Basilica, led a special "recognitio" ceremony, culminating in the removal of the brick wall. 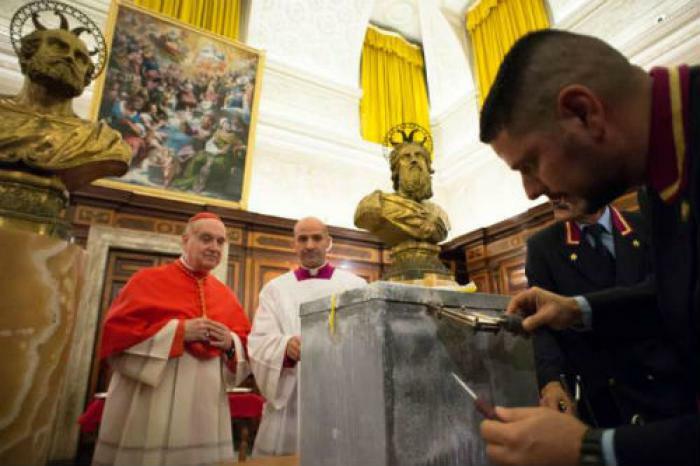 According to a Nov. 17 communique from the Vatican, after the cardinal presided over a procession and brief prayer service, workers began to remove the wall brick by brick, beginning with the extraction of a small zinc box containing mementos from the Jubilee of 2000. Opened with a type of blowtorch, the box held several documents of certification for the closure of the Holy Door in 2000. It also held the keys with which Pope Francis will open it Dec. 8 - the Feast of the Immaculate Conception - when this year's Extraordinary Jubilee of Mercy officially begins. Also inside the box was the parchment deed for the previous jubilee, a few bricks and several commemorative medals. The box's contents were entrusted to the Master of Ceremonies for St. Peter's Basilica, Msgr. Guido Marini, who was also present for the "recognitio" ceremony. Additionally, Archbishop Rino Fisichella, President of the Pontifical Council for the Promotion of the New Evangelization, attended. Each of the four major basilicas in Rome has a holy door, which are normally sealed shut from the inside so that they cannot be opened. The doors are only opened during jubilee years so that pilgrims can enter through them in order to gain the plenary indulgence that is connected with the jubilee. Holy Doors in Rome's other major basilica's will be opened throughout the Jubilee year. St. John Lateran's door will open Dec. 13, St. Mary Major's Jan. 1, 2016, and St. Paul Outside the Walls will open Jan. 26, 2016. One of the novelties for the upcoming Jubilee of Mercy is that for the first time Holy Doors will be designated in every diocese throughout the world. For the first time holy doors will be designated in dioceses, and will be located either in the cathedral, in a church of special significance or a shrine of particular importance for pilgrimages. Though the Jubilee for Mercy doesn't begin until Dec. 8, Pope Francis announced his intention to open the Holy Door in the Central African Republic's capital 10 days early, during his Nov. 25-30 visit to the African continent. In his Nov. 1 Angelus address, Francis said that he would jump-start the Jubilee by opening the diocese of Bangui's Holy Door while in the Central African Republic, as a sign of prayer and solidarity for the war-torn nation. Francis also spoke of the significance of the Holy Door during his Nov. 18 general audience. Sitting in front the St. Peter's Basilica, where he will open the Holy Door in just three weeks, he described it as the "great door of God's Mercy." "On the threshold of the Year of Mercy, I want to reflect today on the meaning of the Holy Door," he said. "It's a door that opens in the Church in order to reach out to those who for many reasons are far away." He said that families are also invited to open their doors "to meet Jesus, who waits for us patiently, and wants to bring us his blessing and friendship." "A Church that is not hospitable or a family closed in on itself would be a terrible reality that mortifies the Gospel and makes the world more arid," he said. The jubilee was announced by Pope Francis during a March 13 penitential service, the second anniversary of his papal election. It will close Nov. 20, 2016, the Solemnity of Christ the King.